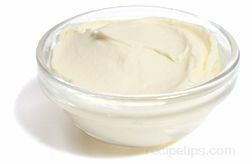 A type of cream containing at least 55% fat content with a rich, buttery texture that is used as a topping for desserts. Unpasteurized milk is heated to remove the water, making it thick and separating the cream from the milk. As a layer of cream forms on the surface, the milk is then cooled and the "clotted" cream is removed. Clotted cream is also known as Devonshire or Deavon cream and originated in Devon, England.